A new statistical method for estimating divergence dates of species from DNA sequence data by a molecular clock approach is developed. This method takes into account effectively the information contained in a set of DNA sequence data. 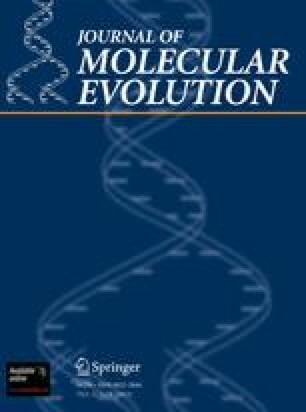 The molecular clock of mitochondrial DNA (mtDNA) was calibrated by setting the date of divergence between primates and ungulates at the Cretaceous-Tertiary boundary (65 million years ago), when the extinction of dinosaurs occurred. A generalized leastsquares method was applied in fitting a model to mtDNA sequence data, and the clock gave dates of 92.3±11.7, 13.3±1.5, 10.9±1.2, 3.7±0.6, and 2.7±0.6 million years ago (where the second of each pair of numbers is the standard deviation) for the separation of mouse, gibbon, orangutan, gorilla, and chimpanzee, respectively, from the line leading to humans. Although there is some uncertainty in the clock, this dating may pose a problem for the widely believed hypothesis that the bipedal creatureAustralopithecus afarensis, which lived some 3.7 million years ago at Laetoli in Tanzania and at Hadar in Ethiopia, was ancestral to man and evolved after the human-ape splitting. Another likelier possibility is that mtDNA was transferred through hybridization between a proto-human and a protochimpanzee after the former had developed bipedalism.